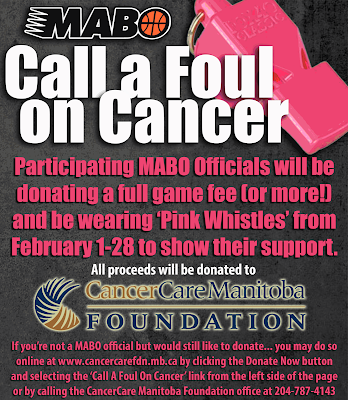 The Manitoba Association of Basketball Officials is once again holding its 6th annual ‘Call A Foul on Cancer’ Pink Whistle campaign this February. Participating MABO Officials will be wearing ‘Pink Whistles’ for the full month of February to show their support during all levels of basketball in the province. We would love to surpass last year’s donations! 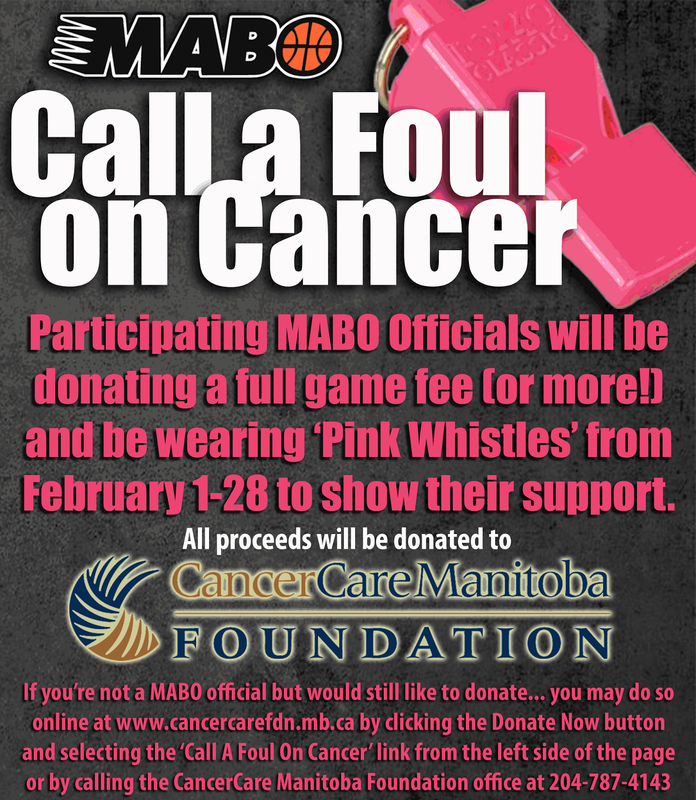 Please join the Manitoba Association of Basketball Officials (MABO) as we look to raise funds for the fight against cancer through the 6th Annual ‘Call A Foul On Cancer’ Pink Whistle Campaign in 2016 by asking you and your friends to consider a small donation to our cause. For those interested MABO officials, we are asking for a minimum donation of a full game fee which includes your very own Fox40 Pink Whistle and lanyard. Please contact your local assignor to donate and order your pink whistle/lanyard before January 28th. MABO has approved the use of the Pink Whistle during ALL games from February 1st -29th, 2016. If you’re not a MABO official, but would still like to donate…you may do so online by visiting http://www.cancercarefdn.mb.ca, and clicking the ‘Donate Now’ button, and selecting GENERAL DONATION. Please make sure to write “Call a Foul” in the comment box, or your donation will not be credited to the event. Alternatively, you may call the CancerCare Manitoba Foundation office at 204-787-4177 to make your donation. Thank you for your support.